Everyone has a dream destination. Perhaps you’ve been daydreaming of standing in front of Grand Canyon. Or maybe you want somewhere off the beaten path like Iceland. But if you’re always broke like me, then you know that saving a travel fund for that trip can be daunting. What if I told you that you can still visit world-class tourist destinations without breaking the bank? Heck, you don’t even have to go outside the Philippines to do that. 1. 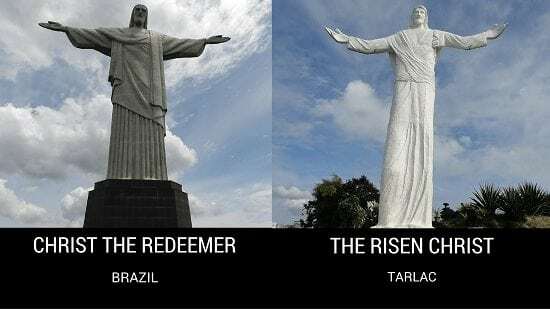 Christ the Redeemer (Brazil) versus The Risen Christ (Tarlac). 2. 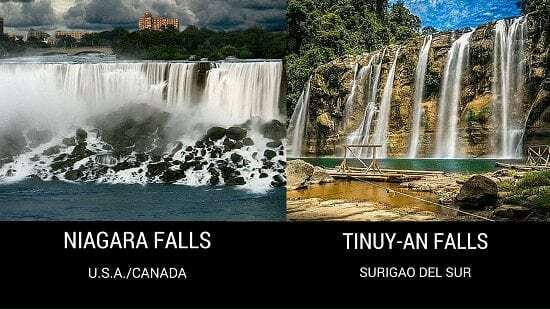 Niagara Falls (USA/Canada) versus Tinuy-an Falls (Surigao del Sur). 3. 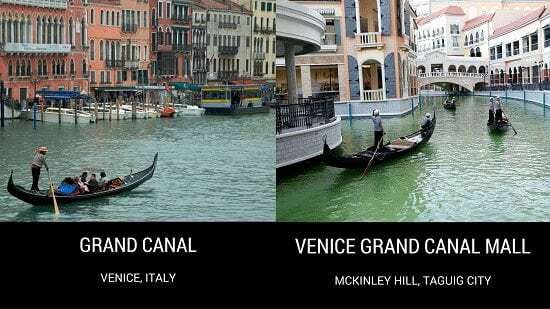 Grand Canal of Venice (Italy) versus Venice Grand Canal Mall (Taguig City). 4. Santorini (Greece) versus Camp Netanya (Batangas). 5. 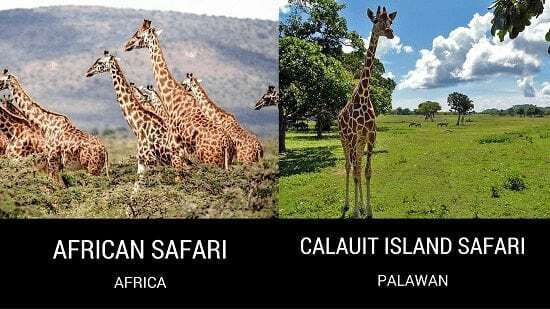 African Safari (Africa) versus Calauit Island Safari (Palawan). 6. 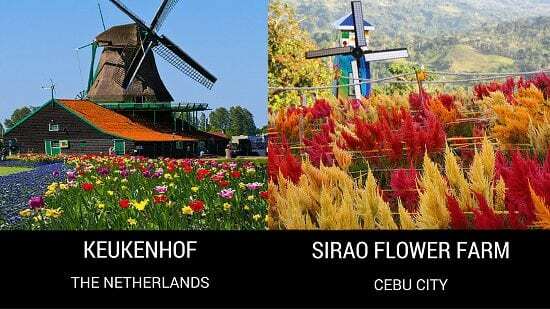 Keukenhof (The Netherlands) versus Sirao Flower Farm (Cebu City). 7. 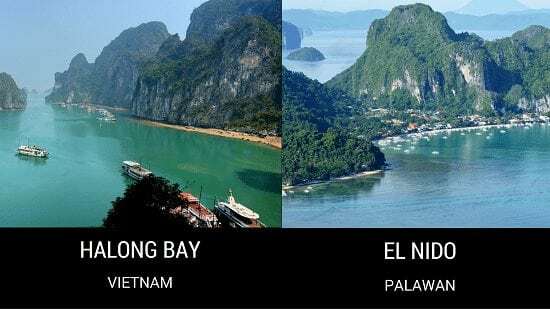 Halong Bay (Vietnam) versus El Nido (Palawan). Photo Credit: Pixabay; penggoy via Panoramio. You know you’re in Rio de Janeiro when you already see the humongous statue of Jesus Christ with its arms outstretched. Towering at 98 feet atop Mount Corcovado, Christ the Redeemer has been Brazil’s most iconic landmark and also holds the distinction of being the largest Art Deco-style sculpture in the world. Compared to its Brazilian counterpart that was completed in 1931, the statue of the Risen Christ in Tarlac is much more recent. The 30-foot colossal statue had its blessing in 2002, two years after the Monasterio de Tarlac was established. Both the monastery and the statue are situated at Mt. Resurrection Eco Park in Brgy. Lubigan, San Jose, Tarlac. In addition to having an Instagram-worthy groufie with the Risen Christ, you can also visit the place to unwind, reflect, and even have a close encounter with the relic of the True Cross (yes, the same one where Jesus was crucified) at the monastery chapel. A favorite destination among honeymooners and daredevils, the 12,000-year-old Niagara Falls never fails to make people’s jaws drop. It consists of three majestic waterfalls: the American Falls, located on the American side of the border; the Horseshoe Falls on the Canadian side; and the smaller Bridal Veil Walls to the right of the American Falls. Equally astonishing is the Tinuy-an Falls in Surigao del Sur. Located at Brgy. Borboanan in Bislig City, the “Niagara Falls of the Philippines” has three cascading falls spanning 95 meters wide. Accessible through a 45-minute habal-habal ride from the city proper, the Tinuy-an Falls was handcrafted to perfection by God himself. Its beauty will make you forget how challenging it is to get there. Oh, and don’t forget to catch the rainbow that usually appears between 9 AM and 11 AM. Your inner child will thank you for that. Romantic, historic, and truly Italian. This is the Grand Canal in three words. Measuring 3 kilometers long and 225 feet wide, the canal is the lifeline of Venice. In a place where automobiles are banned, a waterway like this is the only option to transport goods and people throughout the city. Don’t ever leave Venice without trying out those poled gondolas. Although there are more motorized water buses (vaporetti) now plying the canal, the gondolas remain an authentic source of that Venetian vibe craved by the tourists. For those who don’t have time–and money–to visit Venice or even Macau, a company in the Philippines came up with a bright idea. Located at the McKinley Hill in Taguig City, the Grand Canal Mall features a man-made canal a la Venice. It was built to complement the luxurious dining and shopping experience the establishment offers. A first of its kind in the country, the Grand Canal invites visitors to ride one of its gondolas and take a tour of some Venetian landmark replicas. Santorini. One mention of its name and you’ll imagine the stunning oceanic views and incredible pink sunset. Dubbed as the “Crown Jewel of Greece,” Santorini (or Thira) is an island located in the southern Aegean Sea. It’s actually part of a circular archipelago which bears the same name. The beautiful coastline is just one of many wonderful things Santorini has to offer–and you have to pay the price. Good thing there’s a piece of this island paradise waiting for us in the Philippines. There’s one in Ilocos Sur and another one in Marinduque. 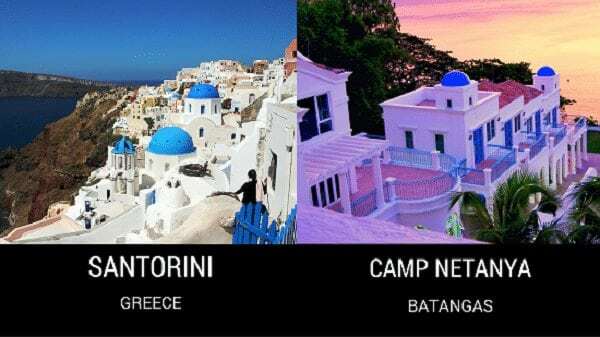 But most people prefer Camp Netanya in Batangas. The resort, just like Santorini, offers people with an incredible view of the sea as well as the sunset, making it a perfect getaway for couples. Located at Brgy. Ligaya in Anilao, Batangas, Camp Netanya will pamper you at an affordable cost. For just Php500, you can avail of its day tour which already includes kayaking and snorkeling among others. Guests can also rent a room and stay overnight, but a reservation is required. Not a single zoo or an episode of National Geographic can ever replace the thrill of watching untamed animals in their natural habitat. Whether it’s the zebra migration across Kalahari or the intimidating lions of Kenya, the African safari will fulfill its promise of giving you an intimate experience with nature. Although it pales in comparison with the African safari in terms of animal variety, the “Little Africa” of Busuanga, Palawan is a gem on its own. Covering almost 3,800 hectares, the Calauit Safari Park is home to giraffes, zebras, and the Calamian deer, which is endemic to Palawan. There used to be a lot of antelopes too, but they had since died out after being brought here from Kenya in the 1970s. Originally called Calauit Game Preserve and Wildlife Sanctuary, it was an initiative of President Marcos. Depending on who you ask, the safari park was either Marcos’ effort to preserve endangered animals or a clever way to generate additional income. But whatever it was, we are not complaining. After all, Calauit is the closest we can ever get to the wild African safari. A tour of Keukenhof is like stepping into a modern-day Garden of Eden. It’s probably the best place in the Netherlands to watch spectacular flower shows and exhibitions. Not surprising at all since Keukenhof, which means “kitchen garden,” is home to more than 7 million spring-flowering bulbs! From the time it was first opened to the public in 1950, the park has been visited by millions who want to feast their eyes on a variety of Dutch flowers you won’t see anywhere else. Speaking of flowers, Cebu City finally has an answer to the Netherlands’ famous park. 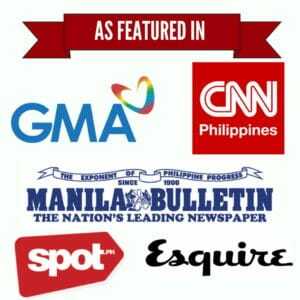 In fact, the “Little Amsterdam of Cebu” recently took the social media by storm and had since attracted a horde of tourists. We’re talking about the now-famous Sirao Flower Farm, a place teeming with colorful flowers and accessible by foot or habal-habal from the city proper. The farm, which is actually a privately-owned business called BJ Farm, grows ornamental flowers intended for kalag-kalag (All Soul’s Day). However, it’s unexpected popularity in social media has made it a desirable destination for people who want to take selfies or groufies with the colorful plants. For only Php20, you can already take pictures with the flame-like celosia and other flower varieties like a coxcomb, daisy, gerbera, chrysanthemum, and even roses. You can’t talk about Vietnam without mentioning Halong Bay. Its towering limestone pillars have made it a distinct tourist destination in the Gulf of Tonkin, located about 165 kilometers from the capital of Hanoi. Covering an area of 43, 400 hectares, the Halong Bay invites visitors to marvel at its spectacular islands and numerous grottoes. No wonder it has become northern Vietnam’s leading tourist spot and was designated a World Heritage Site in 1994. However, if you’ve been looking forward to enjoying places similar to Halong Bay, no need to look further. El Nido of Palawan has equally stunning limestone karst cliffs. Literally means “the nest” in Spanish, El Nido has become a popular destination in the province, second only to Puerto Princesa’s Underground River, because of its amazing blue-green waters, five-star resorts and friendly locals. So book a ticket now and see it for yourself.